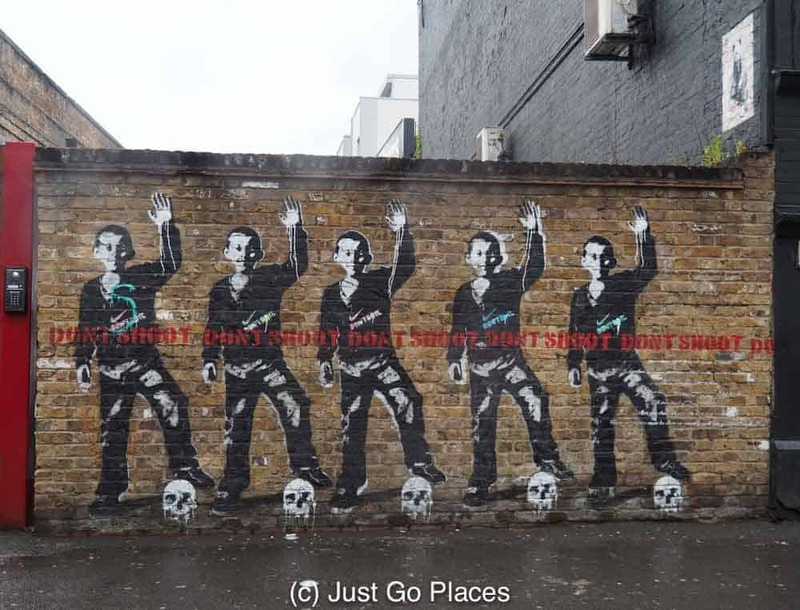 Having always admired the street art in the Shoreditch area of London, I was excited to take a tour with Alternative London Tours. 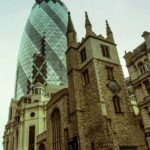 These tours had been recommended by a friend who had previously taken the London Walking Tour by this company. 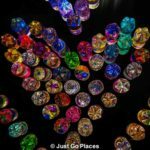 A group of us booked a private tour and workshop through Alternative London tours where we were able to have a street art tour followed by a hands-on workshop. Having been in the neighbourhood previously, I was familiar with the area’s street art. I learned so much from my street art tour of Shoreditch, however, that I have a new-found appreciation for it. 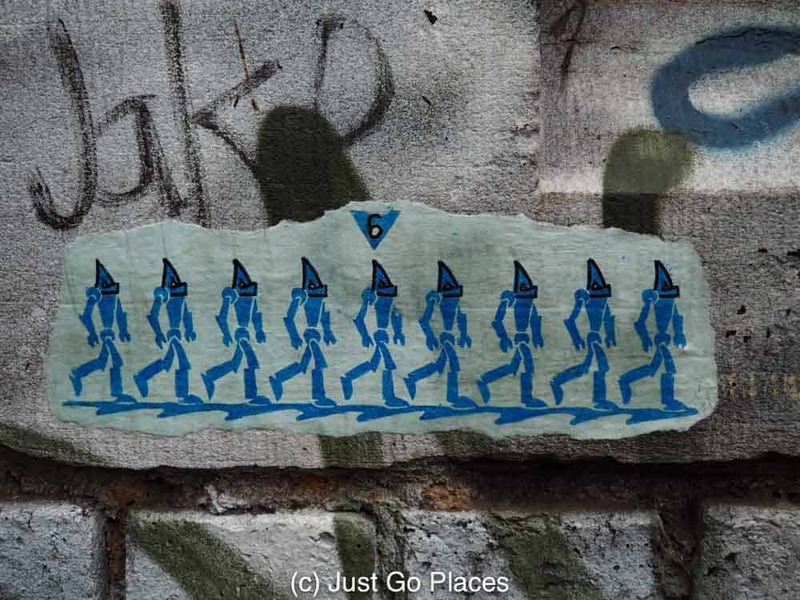 2.1 Street art appears in lots of different mediums. 2.2 Street artists are moving online. 2.3 Street artists are not all youngsters. 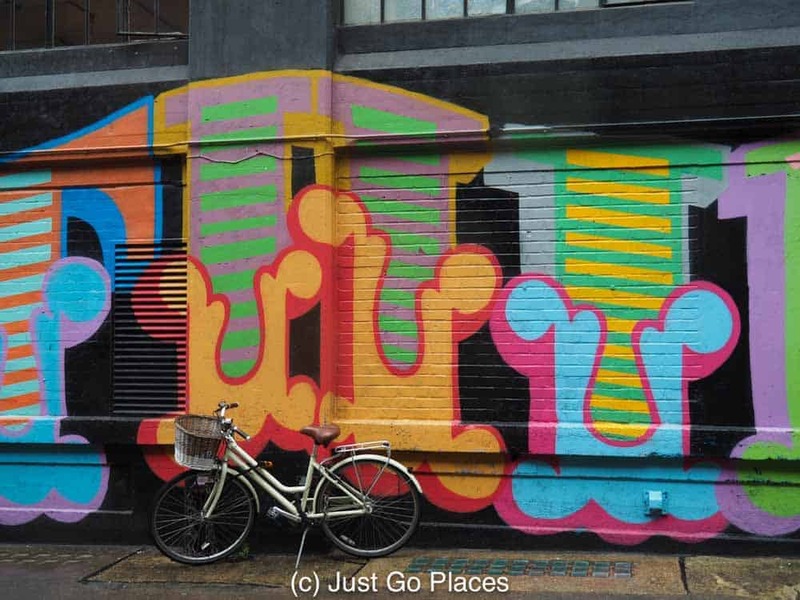 2.4 Shoreditch has street art from artists around the world. 2.5 Street art can convey subtle political messages. 2.6 Street artists may choose to work with the establishment. 2.7 Perceived value is everything. The Shoreditch area has become synonymous with young creatives in London. Located in East London, the area was taken over by people priced out of rapidly rising costs in more traditional areas of west London. 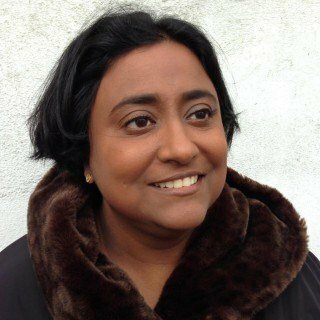 These newcomers, of course, priced out the locals who lived in the area – the working class and Bangladeshi immigrant communities. 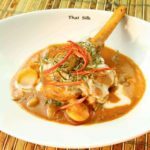 Along with the young trend setters, you got the boutique hotels, hip bars, art galleries and great restaurants. All this gentrification provides plenty of wall space and hoarding to put up street art. 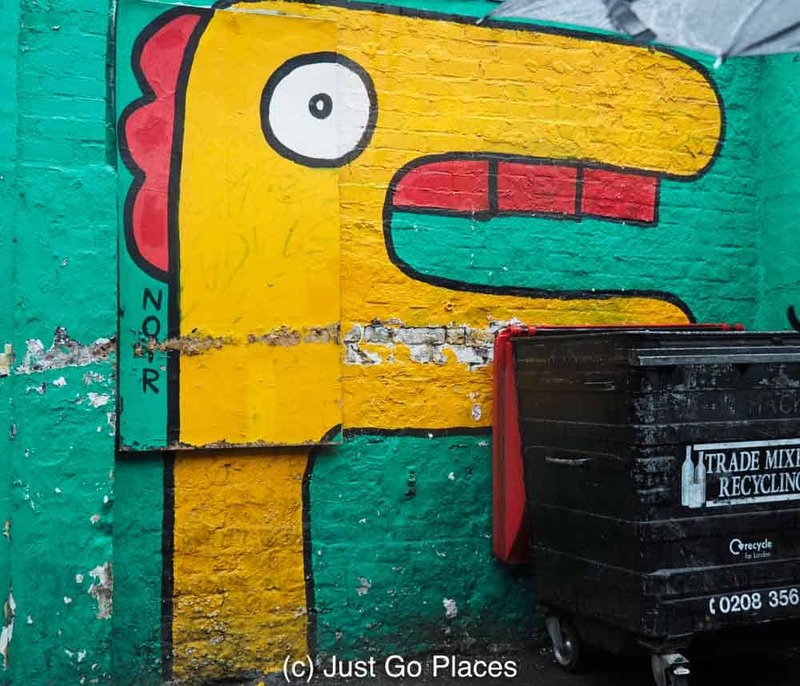 You can find the most street art in any area of London in Shoreditch. Everywhere you turn there is something to catch your eye. Some of the works are put up with the approval of the owners of the property who think it will attract people to check out their businesses. Permission also allows the artist to spend time putting up a more complicated piece of work. The works without permission have to be put up quickly because vandalism is a crime. By its ephemeral nature, he actual street art in Shoreditch is ever changing. On the other hand, you know there will always be plenty of it to see in Shoreditch. Although our tour took about 2 hours, we did not actually go very far because there is so much packed into a small area. Street art appears in lots of different mediums. I’m used to street art being painted like the murals I saw at the Berlin Wall, the buildings of Houston Texas or Batman Alley in Sao Paulo in Brasil. 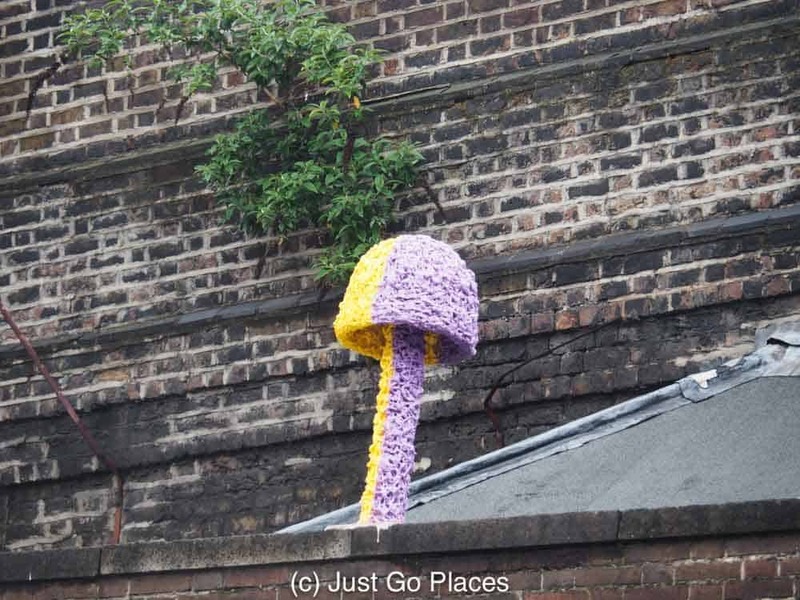 Shoreditch is like a giant open air art gallery or art fair. You get such variety in the works – stencils, paste-ups, tags etc. Just like any art gallery, not all of the work is great quality. I saw some stuff that looked like it could have been a 70’s era velvet painting. Who knows? Maybe, it’s retro chic and I just missed the hipster irony. This is the work of Benjamin Murphy who uses electrical tape. A work by Dr. Cream – paper stuck onto a wall. Citizen Kane works with resin. This guy likes to put polyfilla mushrooms on top of buildings. 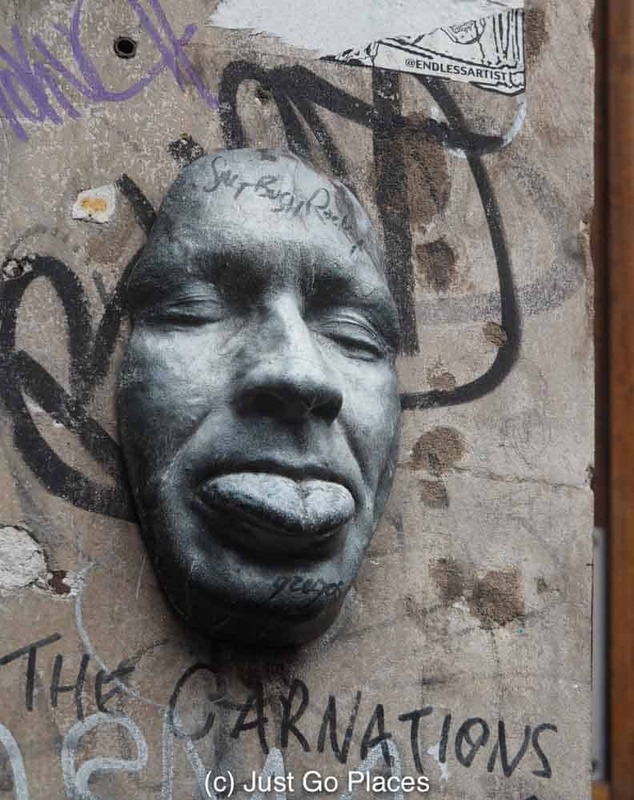 Gregor is a French artist who casts his face into sculpture and then sticks the result on walls around the world. 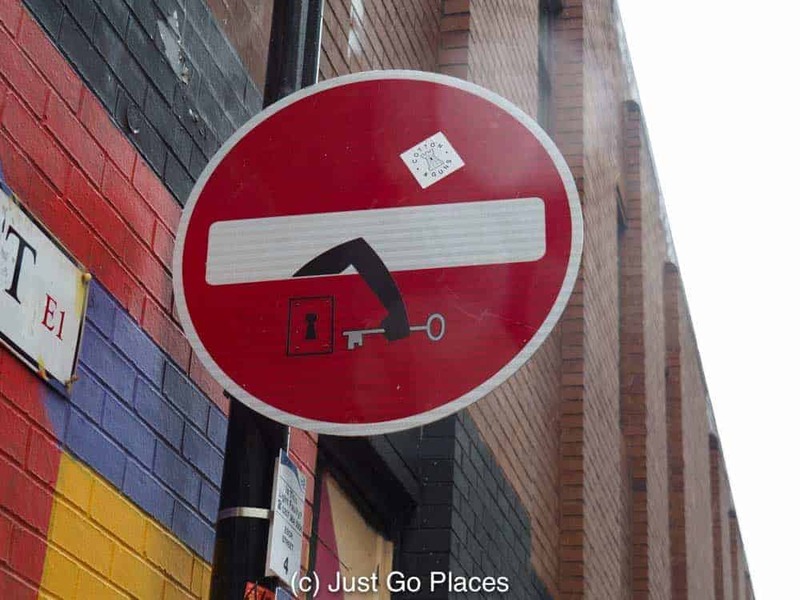 This artist just adds his work onto street signs. 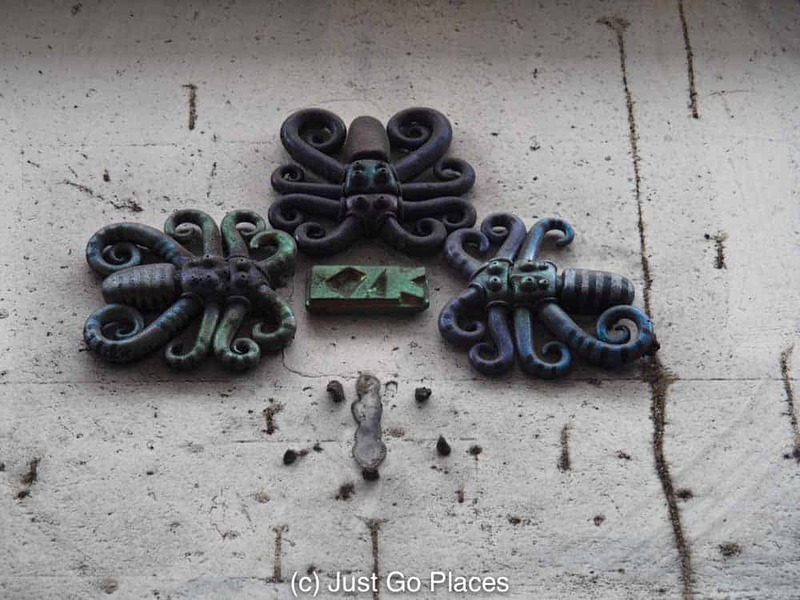 Jones makes bronze sculptures that fit specifically into holes he finds around the city. This piece is plugged into the hole on top of a street pole. Street artists are moving online. 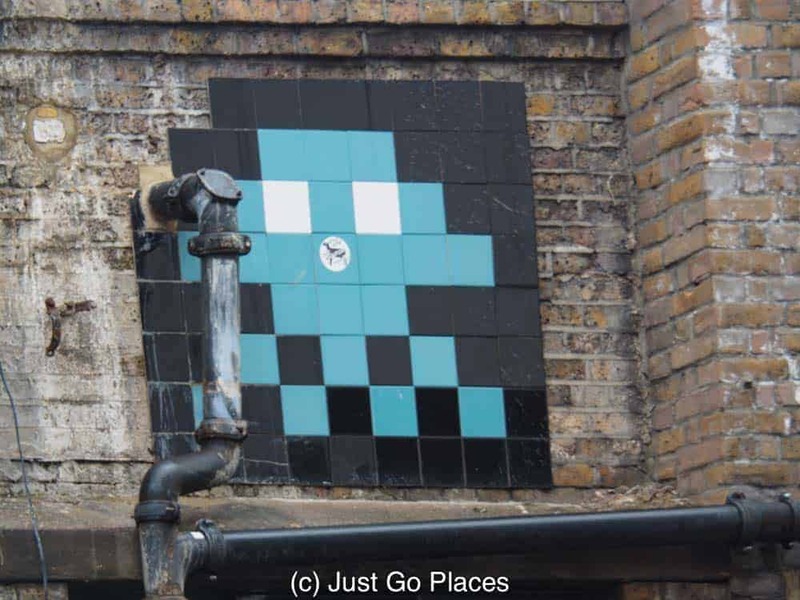 French street artist Invader has his own app (Flash Invaders) where you can search for his work and win points when you find them. 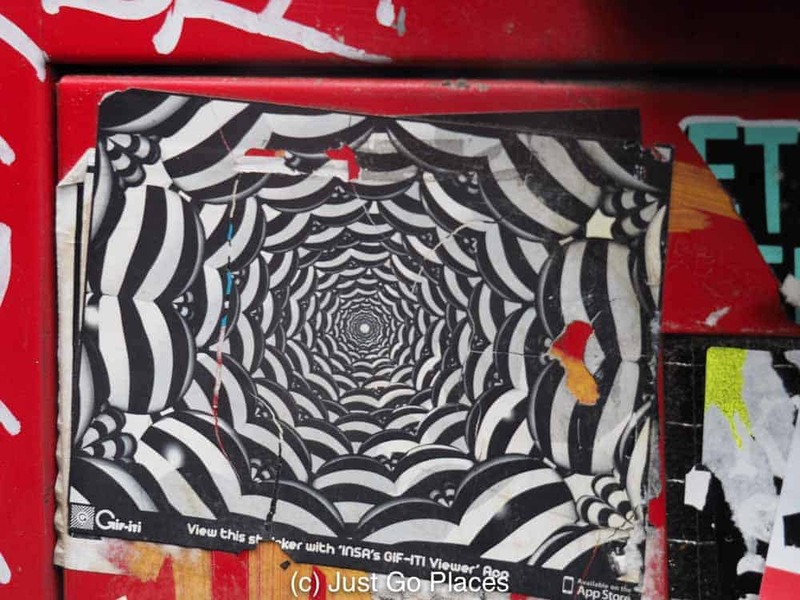 Think geocaching for street art. He has put his distinctive work in about 65 countries. His work refers to the early pixelated video games of the 80’s such as Space Invaders. The highest scorer on the Flash Invaders game has found over 1000 pieces of art. This guy is prolific! 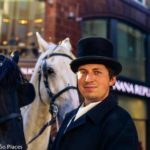 (No cheating – the sites you enter are checked by GPS so that you can’t just pretend to have found his work!). Invader has a signature style based on 80s video games. British urban artist, Insa, creates “gif-iti” which is a term he coined to describe his works. 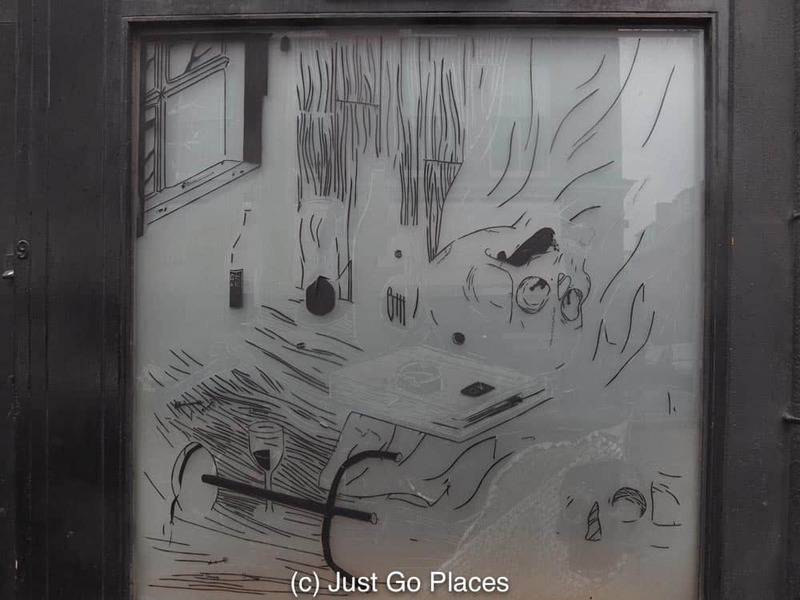 He puts hand-painted art up on the street, and then when you view them through his app, they become animated gifs. Check out his work on tumblr (a natural choice as the home of the gif). His website, Insaland, even has a store where you can buy his works. (What did Napoleon say about Britain being a nation of shopkeepers?) Even a British avant-garde urban artist has an online shop. Street artists are not all youngsters. This poignant piece of work was created by Citizen Kane in memory of his son who killed himself. He was making sculpture out of foam and Fimo in the 1980’s so you figure he’s got to at least 35 years old. A work by Citizen Kane entitled portal. Our guide told us that he had been to a recent birthday party for Australian street artist, Jimmy C. A little digging (ok, Wikipedia) reveals Jimmy C was born in 1973 making him currently 41 years old. By the way, this work took 8 hours to do (which obviously required the cooperation of the building’s owner). I’m impressed at how fast he could do this work! 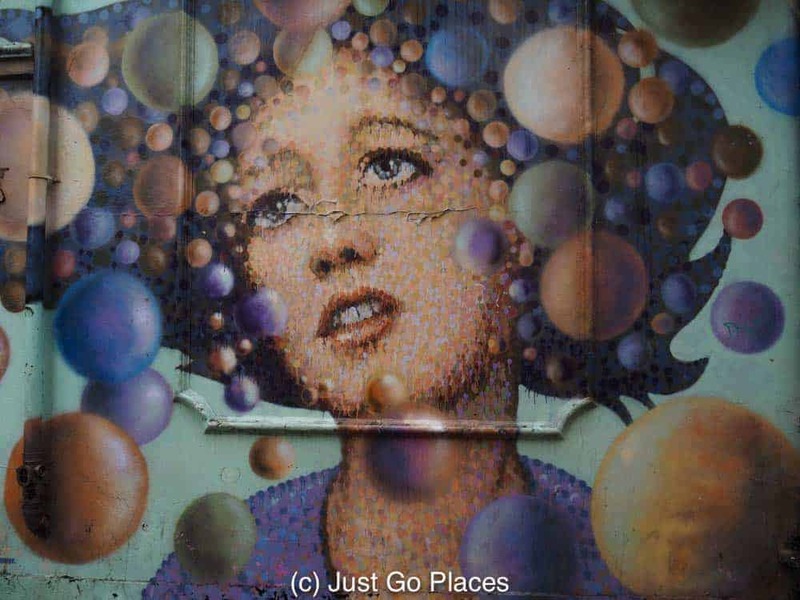 Shoreditch has street art from artists around the world. 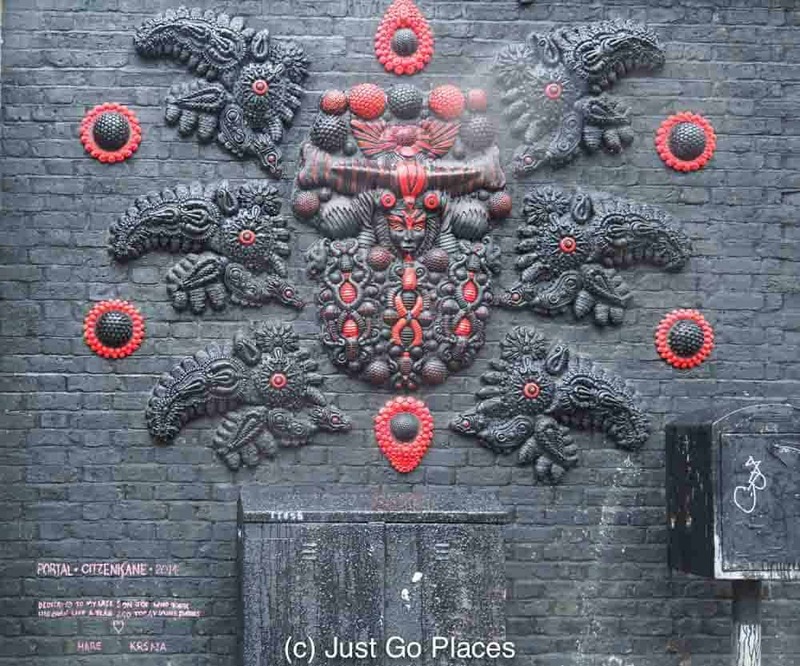 I was surprised by how much of the street art in Shoreditch is from artists around the world. 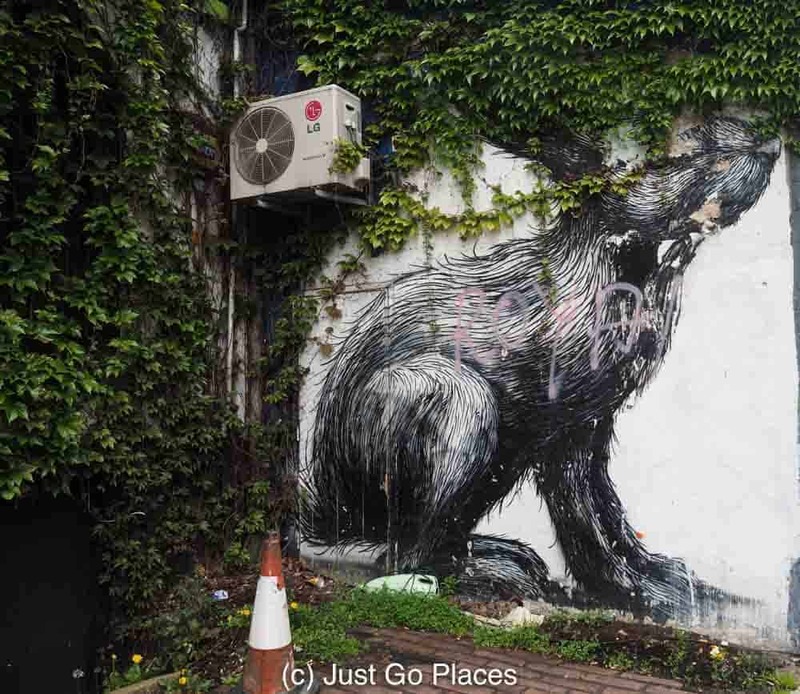 For example, Roa is a Belgian street artist whose works also appear in other major cities like New York, Berlin and Paris. 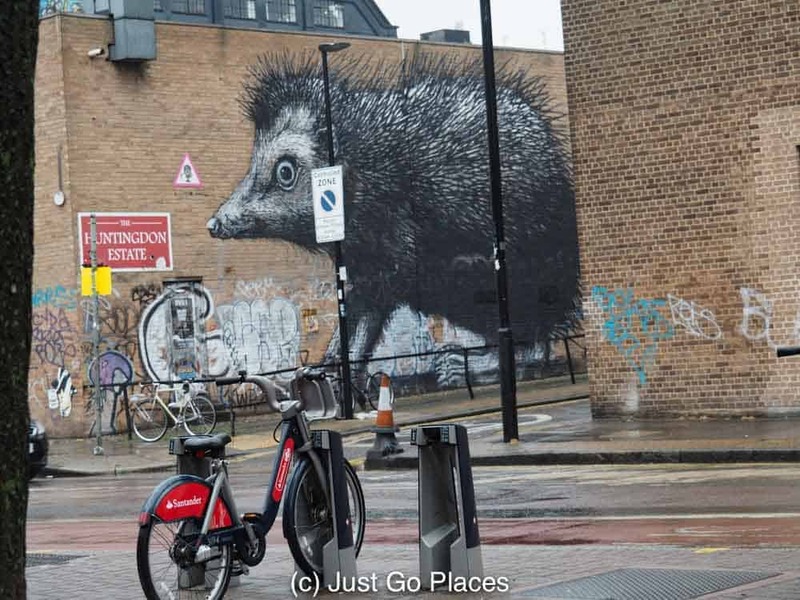 Roa’s work involves monochromatic wild animals. Another grayscale animal by Roa. Street art can convey subtle political messages. 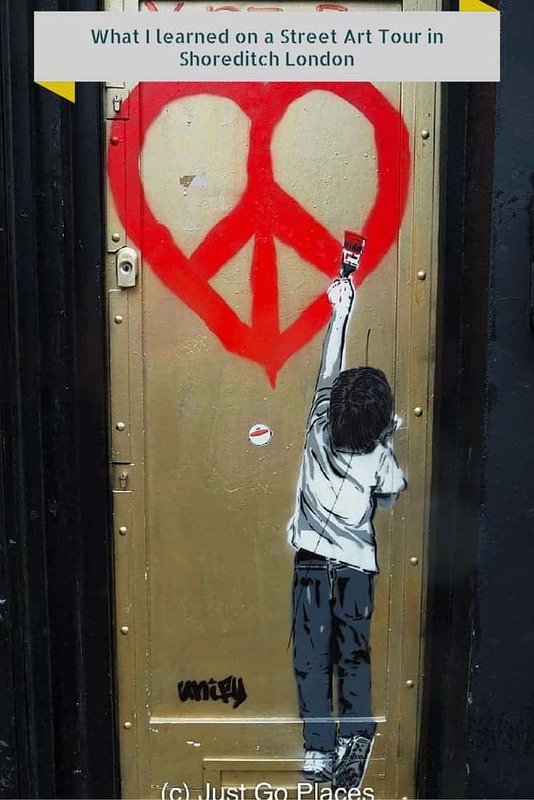 Thanks to the anonymity of street artists it encourages freedom of expression. And, not all of it has to have the hit-you-over-the-head messages from the Berlin Wall. 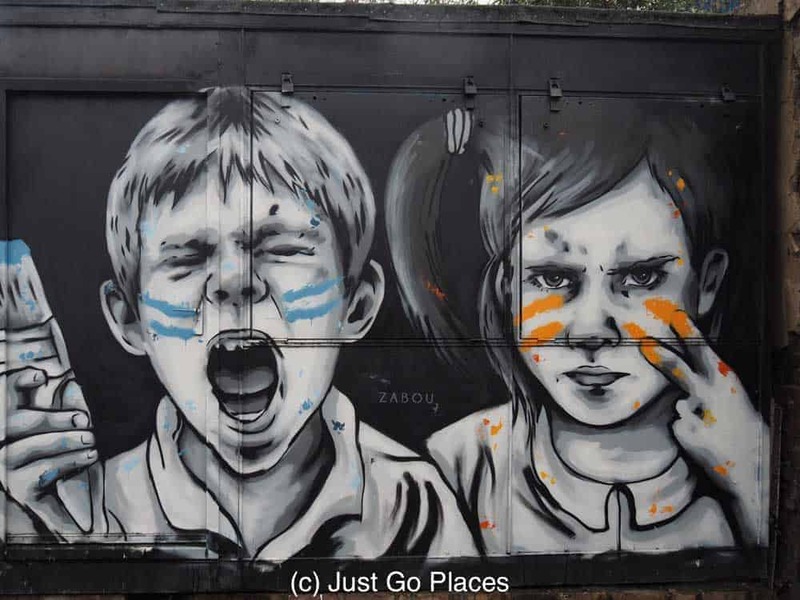 Check out this work by French graphically-trained urban artist Zabou who now lives in London. She, too, has an online store on her website. 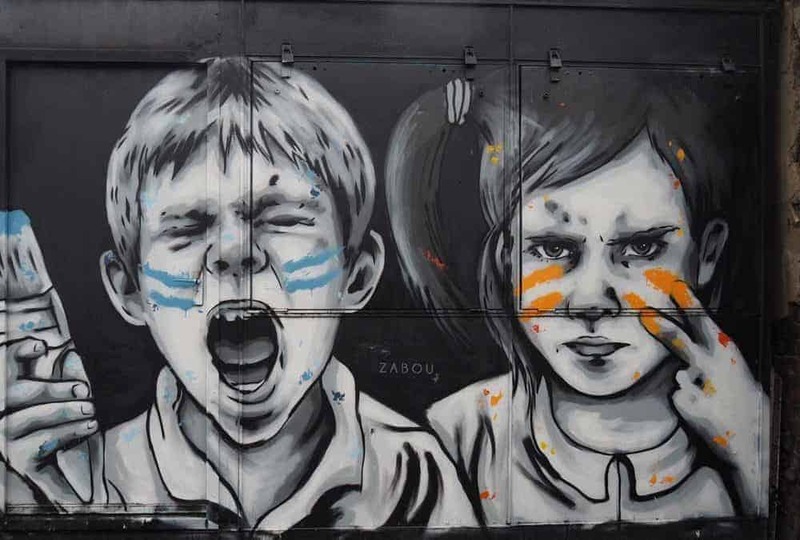 A work by Zabou about children and war (paint). 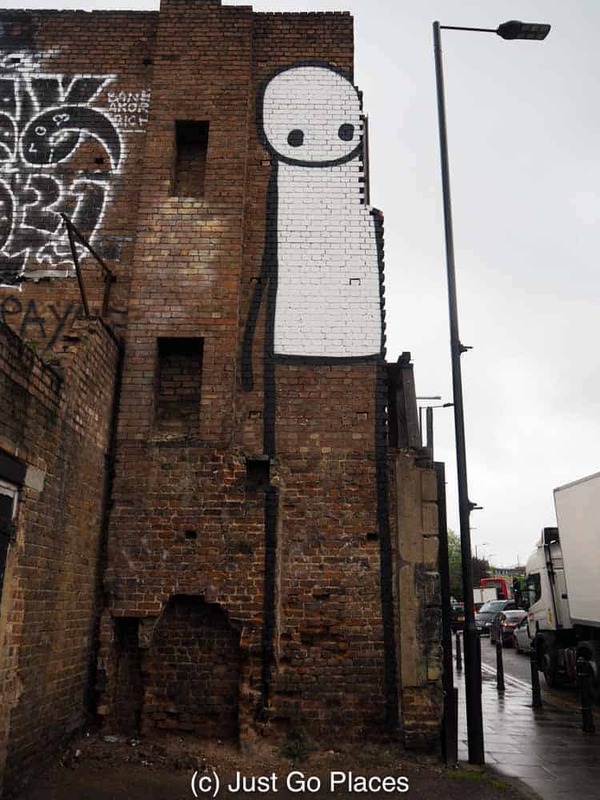 Stik is a home-grown talent who likes to paint these distinctive stick figures. It’s amazing how much emotion can be conveyed in a simple stick figure. This stick man is definitely giving the neighbourhood the side-eye. Street artists may choose to work with the establishment. French urban artist, Invader, mentioned above, collaborated with NASA to send a piece of contemporary art into space to put in the International Space Station. British artist, Ben Eine (say it fast – get it?? ), has had a series of gallery shows around the world. His work has been bought by the Obamas and hangs in the White House. 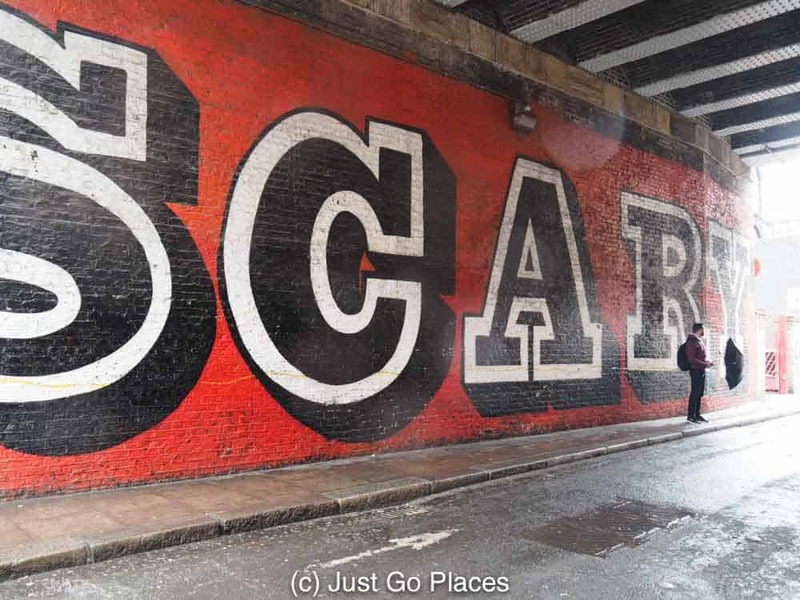 Ben Eine is known for his colourful work using typography. Art under an over pass. There’s about a half-million in difference in price between these two pieces of art. The top one is by British street artist superstar Banksy and is covered in a plastic protective cover. The second one is by Bambi, another British artist. 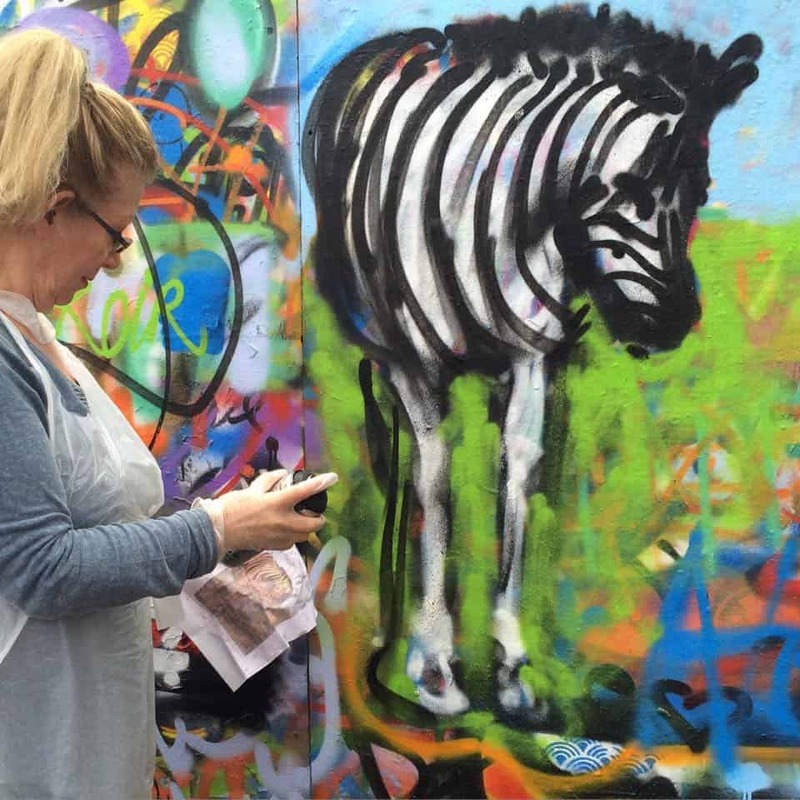 She has been hailed as a female Banksy but has yet to achieve the astronomic prices. 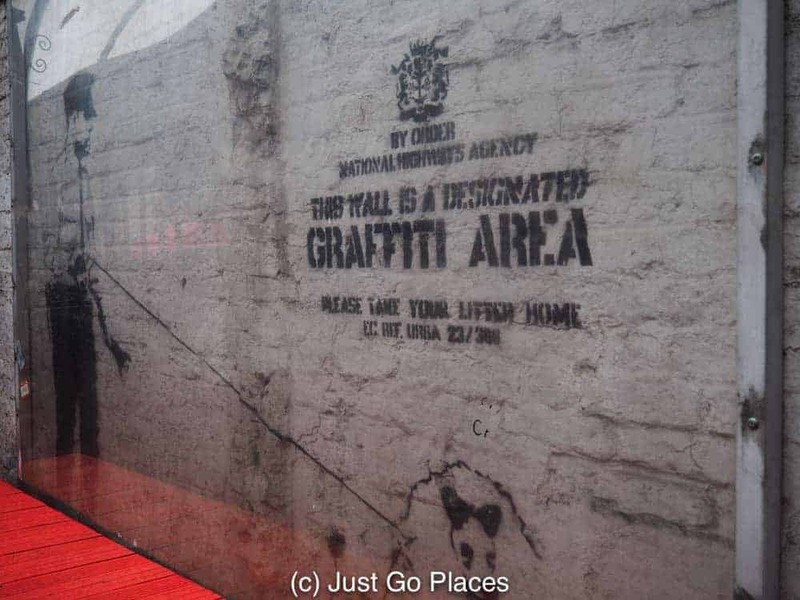 By the way, here’s a comprehensive list of Banksy street art you can still see in London. Banksy street art protected by a plastic covering. You can see the similarities between Banksy and Bambi. This piece is by Frenchman Thierry Noir who is believed to be the first person to have painted a mural on the Berlin Wall. This work is located right next to the Banksy work shown above but is not covered in plastic covering. It sits behind trash bins and you can see the effect the constant banging of the bins has had on the work. A work by Thierry Noir partially hidden by bin. Wow! I learned quickly that spray can artwork is a hard medium to master. I have new found respect for street artists who can quickly throw up a piece of art in a matter of minutes. Apparently it takes 7 minutes from being spotted to having the police show up to disrupt your creativity. I won’t embarrass myself with the work I produced. Currently hanging in my daughter’s room, my piece has pink and green stars and a black unicorn. It’s very Taylor Swift and she loves it. This photo is of my friend who is a real artist – which no doubt you can tell by how great her first effort at spray painting came out. 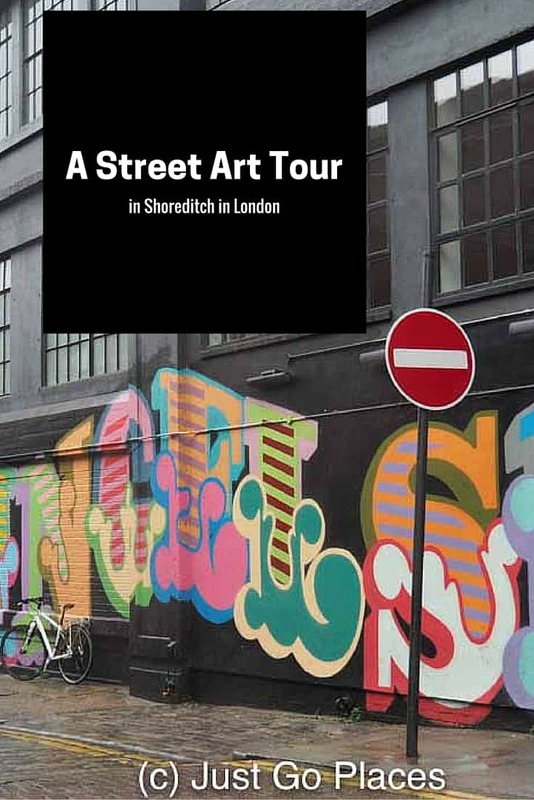 Alternative Tours London runs tours in Shoreditch regularly covering a variety of topics including street art. I found our guide knowledgeable and enthusiastic. A street artist himself, he could have spent hours talking about street art. The workshop, held in Hackney near Columbia Road, was also a lot of fun. I enjoyed it more than I thought I would because I am terrible at creating art. My forte is definitely more art appreciation than art creation. In fact, I enjoyed it so much that I’m thinking of doing a workshop with my daughter. 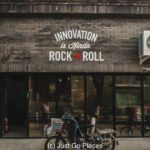 street art murals, and why you will want to join it too. 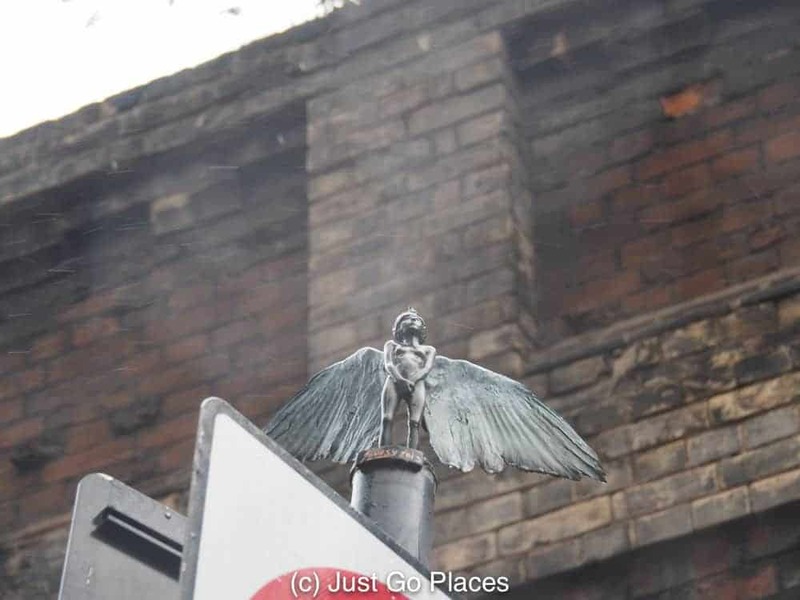 We also took the Alternative London Street Art tour and I loved the art! What I didn’t like so much was the political rantings of our guide. 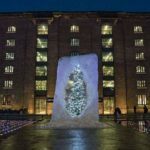 A little slant is fine, but over 50% of his tour was not about the art itself, but his irritation with the establishment, rising rent prices and the changing face of the area. Yeah they are very liberal! Our guide didn’t rant but he was definitely from the area. I like that it is a changing cityscape. The details are ever moving so what you see may not be there next time.